It may look like a pregnant blimp, but it packs one hell of a radar system. 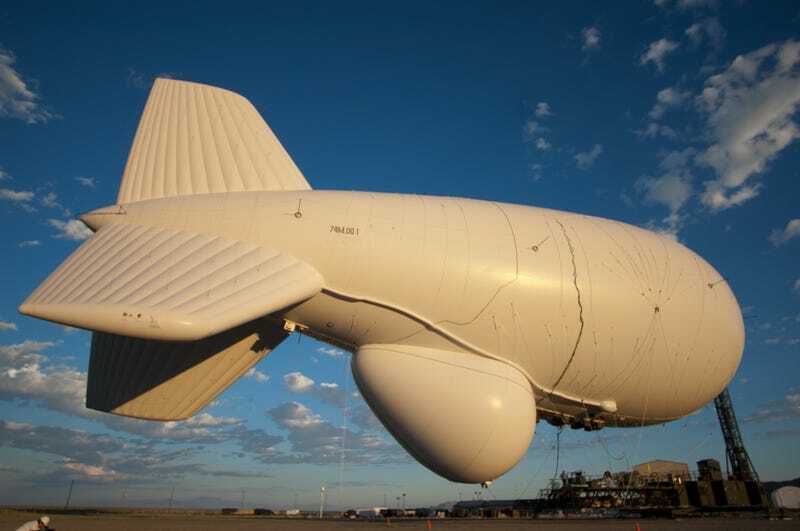 The Joint Land Attack Cruise Missile Defense Elevated Netted Sensor (JLENS) is an aerostat that can haul powerful radars and communications systems up to its perch at 10,000 feet, for weeks at a time. Which is exactly what it is about to do over the National Capitol Region. Update 10/2015: It’s worth noting that since this story originally ran in 2014, the JLENS program has been criticized as an expensive, underperforming “zombie” program. Here’s how it was supposed to work. The JLENS system is actually made up of two 74 meter aerostats, each packing a different radar system. One being a VHF-band long-range surveillance radar, which is JLENS’ primary system, and the other being a sensitive X-band fire-control radar, which has shorter range than its surveillance cousin, but it can gather and transmit incredibly detailed telemetry on a target for possible engagement. The surveillance radar can be used without its fire control radar companion, but in some cases, especially those where targets are detected at long-range, engagement quality targeting data would have to be obtained by other sensors, such as ground radar or a fighter jet’s radar. A fairly elaborate and semi-mobile ground mooring station accompanies each aerostat, along with a single communications processing group and its associated ground support equipment. A crew of four to six people operate JLENS at any given time. JLENS’s primary mission is to provide 360 degree, over-the-horizon radar coverage (with a range of about 350 miles in any direction) for hard to detect and low-flying enemy cruise missiles, aircraft, and UAVS. Its secondary mission, and one that the system has proven to be better at than anticipated, is tracking ballistic missiles, artillery rockets, movements of ground vehicles, ships and especially small boats. Although about three billion dollars have been spent on JLENS over its decade and a half development cycle, and it has always been close to cancellation, with the program reduced to from 16 ‘orbits’ (full systems) to just a two developmental orbits, it could offer remarkable potential once it proves itself operationally. Basically, JLENS does the job of an airborne early warning and control (AEW&C) aircraft, such as the E-2 Hawkeye or the E-3 Sentry, along with some of the capabilities found in the E-8 JSTARs and a littoral surveillance radar equipped P-8 Poseidon, in one relatively cheap and highly persistent package. The main difference being is that JLENS is for defensive operations more than offensive ones, and that it can stay airborne for weeks, not just hours at a time. JLENS is most likely to shine when it comes to homeland defense and the defense of major military installations located near nasty neighbors overseas. Particular locales of interest include the demilitarized zone on the Korean Peninsula, a surveillance mission that JLENS was adapted perfectly for as the main threats from the North continue to be boat attacks, artillery fire, small unmanned aircraft, low flying aircraft and ballistic missiles. The Persian Gulf is also a prime deployment location and export market for JLENS, as Iranian cruise and ballistic missiles remain a threat, along with swarming boat attacks. Israel, is also an obvious potential customer for the system. Beyond the overseas export potential for JLENS, the homeland remains the most fertile marketplace for system. Addressing the possibility of off-shore cruise missile, and even ballistic missile attacks on the US has been a top priority of the DoD since 9/11. Russia now exports a cruise missile system that hides inside a shipping container, known as the KLUB-K Container Missile System, that can launch a deadly 3M-54 Klub cruise missile from a benign looking cargo ship or trawler from hundreds of miles offshore. The container configured Klub-K can also be smuggled into denied territory, transported by truck without detection, and launched anywhere from inside a targeted nation’s own landmass. Countering these types of proliferating threats is what JLENS is all about, and it can do so at a fraction of the cost of keeping a manned aircraft on station for months on end to provide a similar service. This is precisely why the JLENS first deployment will be to watch over the National Capitol Region (NCR) from its tethered perch located at the Army’s Aberdeen Proving Grounds in Maryland. The surveillance radar equipped aerostat will be deployed first, with the fire control aerostat joining it a few months later. The whole exercise, and what may be the acid test for the whole JLENS program, will last three years. According to our friends over at the aviation news site Flightglobal, the second funded JLENS ‘orbit’ will remain in strategic reserve just in case it is needed, while its sister system proves itself by quietly watching over Washington DC. Once fully operational, JLENS will be totally integrated into the integrated air defense system (IADS) around Washington DC, which includes a multitude of radars, electro-optical scanning systems, electronic surveillance installations, rapid-response helicopters, alert fighter aircraft and surface-to-air missiles sites. These SAM sites currently include the short-range FIM-92 ‘Stinger’ point defense systems located on rooftops around the Mall and in Humvee-based mobile Avenger systems scattered around the Capit0l. For longer-range or heavy target engagements, the AIM-120 AMRAAM based NASAMs are deployed around the outskirts of National Capit0l Region, usually near high value installations. 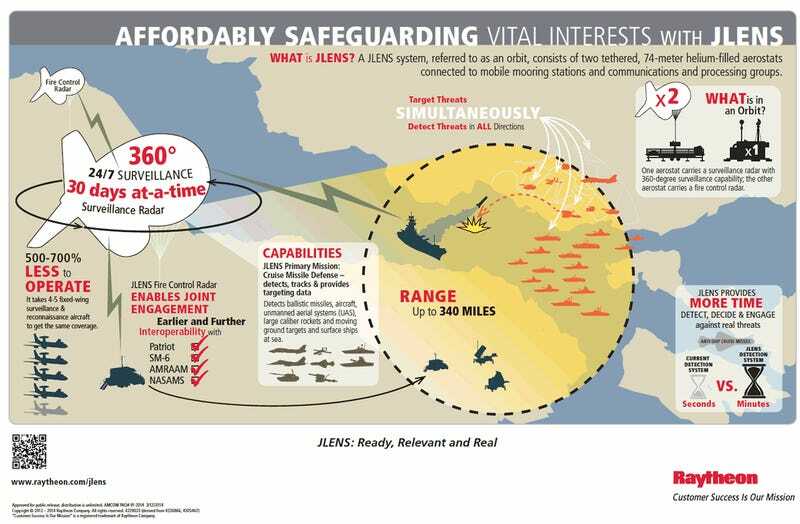 Once JLENS is operational nearby, these systems will be able to use its targeting data if they are called upon to shoot down a marauding or unresponsive airborne threat. JLENS can also haul extremely high-powered cameras to survey the area around it, and to even visually ‘investigate’ targets it spots at medium and short ranges. There have been concerns that the system’s mission near the Capitol will include these camera systems, which some see as a major breach in personal privacy. According to the Army, this is not going to happen for this deployment, but aerostats are the perfect platform for cutting edge optical surveillance systems like the all-seeing, city sized coverage area capable Wide Area Aerial Surveillance systems. Seeing that JLENS can detect moving vehicles (and possibly groups of people for that matter), it will probably be just a matter of time until such a system is integrated into the JLENS concept permanently. In the meantime, sleep safe residents of Washington DC, as a cloud-like unblinking sentinel will soon be keeping watch over your town.